Six feet, two inches tall; 160 pounds; long, shaggy hair; dirty brown knit pullover; shredded work shirt; pants torn so badly they had to be anchored to the legs with rubber bands; shoes with holes where the soles hadn't fallen off. "My son, the bicyclist," Mrs. Anderson announced. 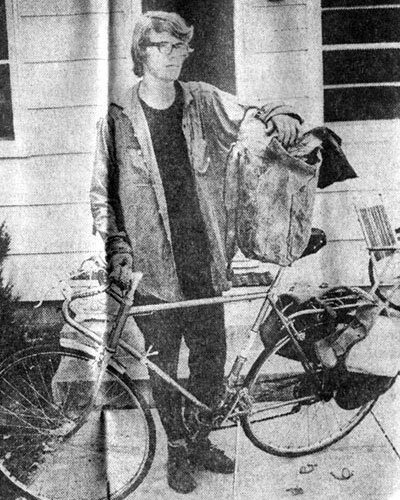 Dean, 17, returned to the Anderson home at 2858 Dellwood Av., Roseville, Friday after a 5,600-mile bicycle trip through western Canada and southern Alaska. Dean was part of what would have been a biking quartet had the four of them ever gotten together. Andy Knapp, 19, and Steve Knapp, 16, sons of Mr. and Mrs. Donald Knapp, 2106 Skillman Av., Roseville, and Howie Graham, 17, son of Mr. and Mrs. Edmund Graham, 1981 Summer Av., Falcon Heights, were the other three. Dean, Steve and Howie left the Twin Cities June 8 and Andy started the following day with plans to meet in North Dakota. From then on it was anyone's guess who would show up where and when. Each of the boys had places he wanted to see, each had bicycle breakdowns or other time-consuming problems. The four zig-zagged around western Canada, occasionally in pairs but more often alone, keeping in touch by mail. Andy, a junior at the University of Minnesota, had a few weeks longer to travel than the three from Alexander Ramsey High School, so he set a longer course and is, in fact, still wandering around somewhere in Canada. All four had started out with somewhat ambitious packs: tents, mess kits, food, extra clothing. Much was eaten up or mailed home before the trip was over Dean admitted. Dean, Steve and Howie got together on the Alaskan Hwy. and biked to White Horse, capital of the Yukon. They took the train, the only means of transportation, to Skagway, Alaska, and the ferry from Skagway to Juneau, then to Prince Rupert and Kelsey Bay, B.C. By the time they reached Vancouver, B.C., Steve and Howie decided their bikes had given their all so the two sent them home by freight and hitchhiked the rest of the way themselves. Dean, on his own, biked through the Banff and Lake Louise area to Calgary, Alberta. He figured if he wanted to be home in time for school, he'd better get help part of the way so "I hopped a freight," he said. "The conductor told me the best places to get on and get off so I wouldn't get caught and the brakeman helped me get my bike aboard." Dean hopped off at Regina, Sask., and biked the rest of the way home. Supplies running a little short at that point, he had "Fig Newtons and orange juice the last three days." He is already planning his next trip to Canada, partly drawn by the scenery, partly by the friendly Canadians who fed and sometimes housed them along the way. The only part of the traveling he didn't enjoy, he said, was "American tourists. They act like they own the road." He said the pedaling got tiresome once in a while, but the boys learned to keep their minds off of it by singing popular songs or making songs up or other "strange things." "I got to be known for yelling at cows," Dean said matter-of-factly. "You know, telling them not to stare." Kees, Beverly. "'Stranger' Surprises Couple." Minneapolis Star. August 26, 1967.